Life is filled with challenges and for people with crippling anxiety it is worse. That anxiety feeds depression, and the two together can define and break a person down, or they can adapt, find ways to manage it and thrive in life. 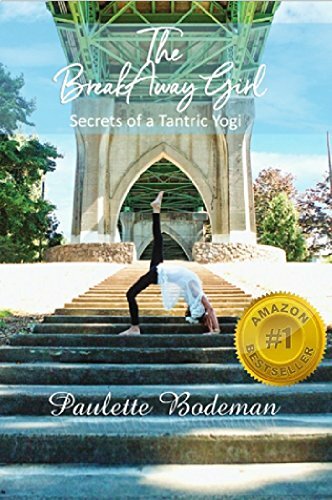 The BreakAway: Girl Secrets of a Tantric Yogi by Paulette Bodeman is Paulette’s memoir’s. Her story ranges from early in life to after her child is grown and an adult himself. This collection of her memories works like the human brain, it isn’t linier, rather the memories flow back and forth leaving imprints on the reader. Throughout the book Paulette slowly discovers yoga in a variety of forms before finding her place, at the end of this book she shares her knowledge with information on how to mediate, yoga poses, and how to embrace your own BreakAway moments in life, be them big or small. Paulette Bodeman decided when she started writing this book that she was not going to just include all the good points or put a happy twist on her life moments. She promised herself to include all the ugly moments, all the hard memories, from addiction, divorce, depression and loss. They were not written with caveats that ‘oh this made me a better person for living through it’. Instead it is just raw emotions. It is real life and despite the jumping from one memory to another often not in chronological order, it is captivating to the reader. Some people will be frustrated by the lack of cohesion from one memory to the next; but I found it relatable and it gave me a better understanding of her. When I think back in time to my own memories it is a jumbled road, and those pieces all fit together in my own broken puzzle, that is what this book reminds me of. You don’t put a puzzle together left to right, you fit them together as you find them and once done you have a complete picture. Much of the book focuses on her finding herself though her experiences and how they all led her to where she is now. But written in her style that path isn’t clear. In the last part of the book she explains her views on BreakAway moments, big and small. She talks about how they are the defining moments in your life that you may or may not even reorganize as being a defining moment. This last part pulls together everything she wrote. The inclusion of mediation suggestions, yoga poses, and spiritual healing ideas just completes the book. You start reading about her chaotic and disjointed life and end with a guide on how to find your own path through your own chaos. This is not your traditional yoga book, it is not your traditional book on finding inspiration in life or how to better yourself. It is not a self-help book you pick up and read step by step to find your perfect balance. It is a book that will inspire you, give you bits and pieces you can relate to and give you suggestions on finding your own inner peace at your own pace and discovering your own BreakAway moments and how they have defined you.